Follow these 7 easy steps to make spring rolls stuffed with your choice of veggies, proteins, and sides. These gluten free Asian rolls can be stuffed with your favorite veggies, proteins, and sides and have a pasta texture on the outside. Encourage your children to make their own by selecting their favorite pre-cut veggies. 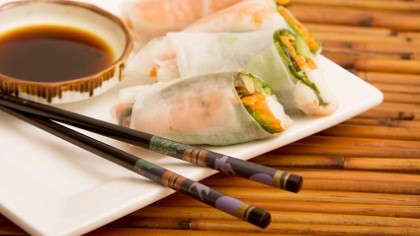 Soak the first spring roll wrapper in warm water until the texture turns flimsy and translucent. Transfer to a clean dishtowel and pat lightly to dry. Place 1 slice of avocado, 3 shrimp, a carrot, a slice of pepper, a green onion, and a pinch of cabbage on end of wrap. Roll forming a log, tucking in the ends half way. Dip in your favorite soy sauce or Asian dipping sauce.